The German Metal band EMERGENCY GATE was formed in 2005. 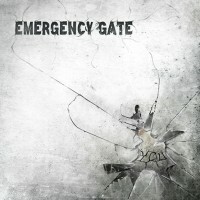 Well, according to Metal-Archives.com it was in 1996 that the band saw the light of day and in 2000 they released a first album called “Emergency Gate”. Due to whatever reason, it took the band six years to put out a new album. Their mix of Metalcore and Melodic Death Metal as presented to the masses in 2006, when their debut album (as a signed band) “Nightly Ray” was released. A line-up change and hard work later, album no. 3 came out: “Rewake” (2009). That same year and after gigs with a.o. CALIBAN, ELUVEITIE and others, EMERGENCY GATE went into the studio to record album no. 4, “The Nemesis Construct” (2010). Tom Englund (EVERGREY) featured as a guest vocalist on the song “Darkside Of The Sun”. Anno 2012 the band wrote its fifth studio album, which came out in January 2013 under the title “You”. Short and to the point, one might say. The release occured via Golden Core Records. I had never heard of this band and to be honest, when I heard the trailer that preceded the release of “You”, I found the songs alright, though nothing more. And still, I was sent a review copy, so I had to reserve time to listen to all of the 12 tracks. There’s also a limited edition with 3 bonus tracks and a DVD. “You” begins with “Mindfuck”, which doesn’t kick off instantly, rather creates a good amount of tension through the piano an symphonic backings. And the furious modern Metal is unleashed. Add aggressive vocals and the picture is complete. Melodic input is delivered by the keyboards, adding an electronic/industrial touch to the whole during the chorus, at which point the vocal roles are split between clean and screams. There’s room for solos, one coming from the keyboards (piano backed by a breakdown moment), the other on guitar. All in all, a very nice song to start with. And so is “Force United” that starts with distorted guitars and pounding drums. The rhythmic piece (the groovy guitars and drum pattern with the china cymbal) that follows is copy-pasted from NEVERMORE’s “Final Product” (“This Godless Endeavor”, 2005). Yes, I say ‘is’ because it sounds too similar, if not identical, to be created from scratch. I’m not for or against it, but this piece is, to me, so typical for that NEVERMORE song, that it’s hard to listen and not think of Jeff Loomis and Van Williams. The pounding part that preceded is the verse section. Like before the melodicness comes out in the chorus, which sounds rather emotional. The piano adds to that. Early on, a guitar solo strengthens that impression. The Metal aspect of the song reminds a bit of SCAR SYMMETRY. The keyboard moment then interrupts the process of pounding Metal with a composition that could easily fit in a Dance hit. It sounds a bit out of place, one might say. But no worries, it doesn’t last that long. Melodic Metalcore is on offer in “Moshpit”. Lyrically this is… not a serious song: “Get in the moshpit…”. Really? Oh, and musically (chorus) we have another copy-paste or similar piece that can, for example, be found in AMARANTHE’s “Hunger”. The pattern of using clean vocals in the chorus is also applied here. In se, not a bad song, but there’s much better material on “You”. It doesn’t get better with “Feeling Inside”. This is a more linear song with the music being of the Rock kind rather than the Metal kind. Synths leads the way and the aggressive vocals remain a constant factor. The clean singing in the chorus lacks drive and passion, as if the desire to sing is absent. Although it’s nice, for a change, to have an accessible song, this one does bore rapidly, I must admit. Another accessible and rocking song is “Liar’s Truth”, which in the first instants reminds heavily of IN FLAMES, as it advances slowly and contains atmospheric backing. Aggressive verses contrast with a melodic chorus. And this is also one of the better tracks on this album. “Breathless” is a midtempo rocker, not as aggressive as the previous songs. Although the clean singing lacks power, it’s supposed to be this way, as it fits the music better. The melodic and emotional chorus is, however, not among the best. It sounds emo. And I do mean Emo as in Emocore and alike. However, there are no screams… yet. Things do get heavier and more Metalcore later on. There’s even an acoustic twist in the chorus then. Not the best move, in my (humble) opinion. If I may be honest: Funeral Doom makes me happier, so to speak. Time for the last highlight: “rEvolution”. Synths play the main theme at first, then guitars and drums take over, while keyboards revert to atmospheric backing. Dark, aggressive verses are opposed to a melodic bridge and chorus. The music is good and IN FLAMES comes back to mind. The revolution is brought out more clearly with news reports about the uprising in Lybia, Egypt, Tunesia, … that happened in 2011. “You”, the title track, takes a Punky start with shouting and drums, while when the entire band is playing the music still has a Punk feel, but with electronic keyboards. The clean vocals don’t sound or fit that well here. Emo plays another part (see modern IN FLAMES). The chorus is very accessible and Poppy. But it’s not like this will save the song, let alone the guitar solo, which does come as a surprise in the song. “Lean On Words” begins with a piano intro and as the music grows in mass, it’s a battle of melody vs power. The clean, calm verses contrast with an aggressive, yet melodic bridge, while the chorus is of the power ballad kind. But honestly, it’s not that… I don’t get a “Wow!”-feeling. I mean, there are much better love songs out there. And why is there a breakdown (with keyboards in the back)? At this point the clean singing is over and it’s time for screams. But after several songs with screams, you know what you’ll get. But my point is: a little too much screaming on this album? Overall, one of the least good songs on this release. “Regret” offers fast, melodic Thrashy Metalcore with clean verses, an emotional and melodic bridge connecting with a more aggressive chorus. Music-wise, no complaints from my part. Lyrically and vocally (cleans and screams)… no, thanks. “Back From The Grave” is a Poppy Rocksong where melody also plays a significant role, especially in the catchy chorus. Singing again happens with the two types: clean and screaming. Last but not least, there’s “Say Goodbye”. This is another emotional song, where you get a huge contrast between the pounding Metalcore verses and the softer, melodic chorus. “You” is the first EMERGENCY GATE album I hear. Previously this band was unknown to me. On offer is Metalcore/Melodic Death with electronic keyboards, resulting in accessible songs. All in all, this is not a bad album and mainly on a musical level the band did a very decent job. However, in my humble opinion, vocals don’t always follow suit, i.e. they don’t always fit or the timbre should have been different. And that impacts the listening experience.